If this is useful, here is how to connect up an Innovate LC-Wideband sensor and controller. I had this working before when tuning the Weber but because I crashed and left my last one on the road, I am redoing it. This allows you to read the Air/Fuel mixture, which is useful for tuning your carb. If like me, you are not confident enough to work it out by ear, spark plug tests etc. Well, it is accurate so I think the tuning process will be faster and more accurate. You can get a readout on a data display on your dash so while riding at the points where the jets come in on your carb you can see exactly the effect and accurately re-jet – also for adjusting the idle. It can also show you the effect of seasonal and altitude changes, so you can make informed decisions on when and how important it may be to adjust the carb for those changes. 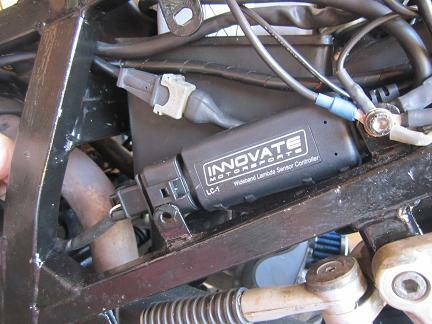 These are being sold on e-bay for US200 at the moment, but it looks as though they are being superseded by the LC-2 (http://www.innovatemotorsports.com/products/lc2.php). You just make sure there is a kit with a gauge or you add on a gauge to your order. I also ordered an extra bung and screw plug so I could swap my sensor between the front and rear exhausts to measure both cylinders. Here is a picture of the pack I used. 1. 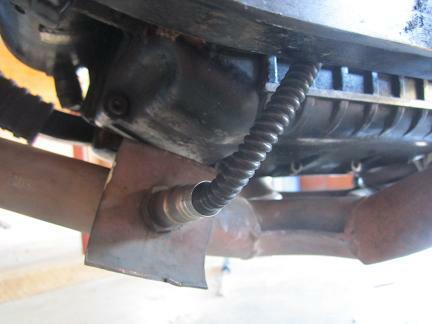 You will have to take off your exhaust pipes and get the bung/s welded in. I took mine to a motorbike engineer. I think it cost me $50. I got an extra bung (ordered 1 extra) put in so I could swap the sensor over to measure both cylinders. As per Innovate's suggestion I cut a piece from a copper pipe, drilled a hole and used that to displace heat when you screw in the sensor. 2. At the other end there is the readout gauge. This could either be mounted on the dash where the clock goes or on that dash strip. 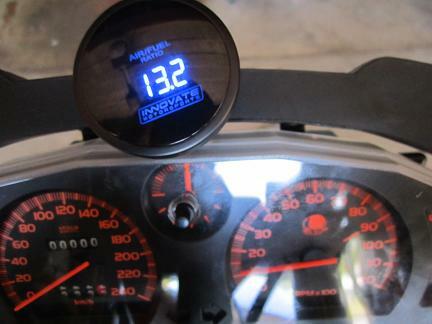 Follow the Innovate instructions to wire up the the gauge with the Wideband controller, the gauge and the bracket. I then enclosed the bundle of wires in some heat shrink (not shrinking it) and bound it up in electric tape. The Innovate supplied bracket that the wire bundle is attached to can now be bolted on to the horn attachment. 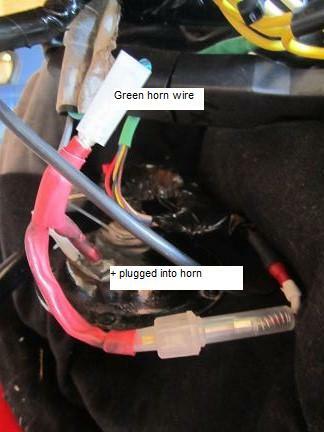 This also requires a fuse for the power/red wire and, to attach it to the horn, wiring into the horn green wire. 4. Connect up the Wideband sensor and controller. 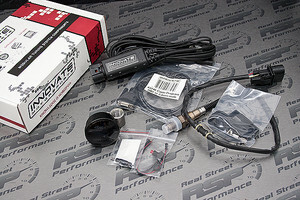 The wire from the sensor can be fed up to a point on the frame and likewise the Wideband controller can be fed from the horn attachment to the same point on the frame and the two connect up. 4. Calibrate the sensor. 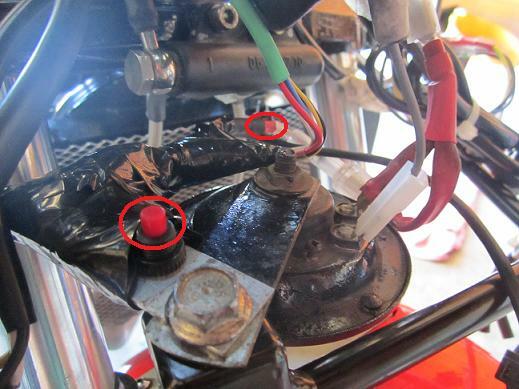 In the picture above the small circle is around the small red flasher and the larger red circle is around the red push button. These are used to calibrate the sensor - which is done with the sensor out of the exhaust pipe. After doing that screw the sensor back into the exhaust. NOTE: There are also two wires from the Wideband controller that can plug into your PC and with the innovate software you can record a graph readout. I tried this with a laptop in my backpack, but really I don't think it is needed. Riding and checking the gauge readout in real time seems ample enough feedback for your carb jetting decisions. You do need to log rides to see anything you could really use. The readings when riding & reading will be blipping around. Do log, several long runs and preferably under load, driving uphill. a hint how to jet/adjust. To get real useful data, you´ll need a Throttle Position Sensor, too. Now your logging only shows AFR, not with various throttle positions, right? I've used a LM-1, it's a helpful device. Last edited by Tamburinifan on Wed Oct 09, 2013 11:16 pm, edited 9 times in total. Microsquirt will do the same thing for less overall. Awesome stuff Warwick and very well done too. I've always relied on the seat of my pants to judge the mixture but well know a dyno-shop truly gets the best result for fuel injection. usually it`s said that on a motorcycle the sensor should be fitted ca. 30cm from the cylinder head flange. If the synchronization is right you only need to measure on one cylinder, that would be ideally the rear as that is more critical. More and more cars now use two sensors. One in the collector and one after the catalytic converter. The first sensor is full in the exhaust fumes while the second one is in contact with the surrounding air. The surrounding air is used as reference to correctly measure the residual oxygen. The sensor also needs a certain heat to work properly just like a catalytic converter so the more you move it away from the engine the more imprecise its output will be. do you think this one will be more useful? that makes me wonder as some datasheets for Bosch sensors state: ideal operating temperature for sensors 550-700°C and wideband sensors up to 800-900°C. You won`t get those temperatures everywhere in the exhaust. But this is going a bit offtopic, sorry. not quite right, the heat source is not to get them to ideal operating temperature but to boost their activation time. The sensors only start working when they reached min 250-350°C. ...You do need to log rides to see anything you could really use. Hmm, I think it's not fair to say the digital gauge is not accurate. It is exactly the same data - it's just displaying it on a gauge or as a data graph. That's the same thing. In the video link, that is the sort of up and down reading I would get on the motorway when the pull on the motor goes up and down, but if you ride up a hill e.g., in 3rd gear and the pull is consistent then the data readout is stable. Anyway, if you make multiple tests reading graphs or a gauge you will, I think get clear and right information for your jetting changes. On the throttle sensor - I also think there is not an issue. You can learn soon enough by reading about the points where you carb jets come in in relation to revs and acceleration, e.g., very slight throttle being idle jet, etc - that info is available as tuning info and you can easily enough take it into account. AFR readout, any which way you look at it, is a huge help in tuning. I do agree it can be mesmerizing and think referring to a gauge while riding needs multiple tests, so by glancing every now and again over multiple uphill tests you really get it right. I think, yes better on an out of town hill and better to take a gauge away, or unplug for normal driving. I think for me then I will not attach it this time where the clock goes. Actually, yes sergiomala's link http://www.ebay.it/itm/290985675170?ssPageName=STRK:MEWAX:IT&_trksid=p3984.m1423.l2649 seems a solution for anyone's preferences. I'm truely tempted........ as long as my bike is not running smoothly, overall in low rpms range or starting after a red light. But the Wideband a/f gauge is only one of the parts. I need also the manual of the weber carb to know where to touch in order to obtain the best response to the gauge. I have never had my hands on a car carburator installed on a bike. I apologize for my ignorance, but just to know, if the value is too low, means poor moisture or rich moisture?